Part 7 of my review of the book: “The Big Picture: On the Origins of Life, Meaning and the Universe Itself,” by Sean M. Carroll. Part 6 is found here. 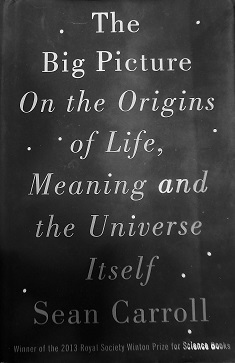 In the chapter titled “Light and Life,” Carroll discusses the meaning of what life is and the origin of life itself. He makes a passing comment that at least bacterial life may be found on another planet. He mentions, as a fact, that Europa, which is one of the natural satellites or moons of Jupiter, “… has more liquid water than all the oceans on Earth” (p.238). But that has only been conjectured if there are liquid oceans underneath Europa’s frozen surface ice. The oceans are thought to begin 20 to 50 kms (12 to 30 miles) below the surface. Thus it may be sometime before the conjecture can be confirmed or denied. If there is anything we can learn from this, it is that Carroll is not phased at presenting as fact something he hopes to be true. To my knowledge, as of writing this, no oceans have been definitely discovered on Europa. He asks the question, in regards to looking for life in space, will we know it is life when we see it? He gives NASA’s definition as “a self-sustaining chemical system capable of Darwinian evolution.” (p.238) He claims that the ‘correct’ definition of life doesn’t exist. Yet he offers the following. Edwin Schrödinger, who helped formulate quantum mechanics, believed it was one of balance, balance between change and maintenance of structure and integrity. His definition is as follows.